Budmerice, a little village between Bratislava and Trnava, situated in the shadow of the Small Carpathians, is big by its history. With its past is associated the mighty Palffy dynasty that participated on the process of shaping the mediaval Europe. Budmerice, a little village between Bratislava and Trnava, situated in the shadow of the Small Carpathians, is big by its history. With its past is associated the mighty Palffy dynasty that participated on the process of shaping the mediaval Europe. The most famous spot in Budmerice is the manor built in the year 1889 in the Romanesque ecclesiastical style and belonging to the Duke Jan Palffy. Its front ends over an entry portal with the heraldry of the Palffy dynasty and a high turret. The manor is surrounded by brilliant English Garden and till the year 2011 served to the Association of Slovak Writers as a place for their inspiration during their writing. The manor is now under reconstruction. Nearby Budmerice, in the Lindavský Forest, attracts tourists another manor. 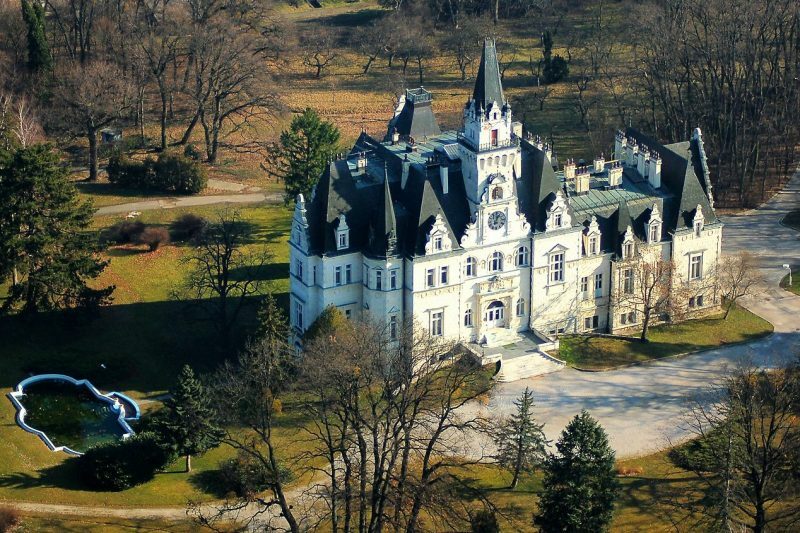 Having been built in the years 1888 and 1889 for the Duke Jan Palffy and his 16-year-old wife Elisabeth, born Schlippenbach, the manor served predominantly as Jan Palffy’s hunting manor. The Duke Jan Palffy died in the year 1934 and the only heir of the whole estate became his son Pavol Palffy. Pavol emigrated in the year 1945 and his estate became property of the Czechoslovak Republic, later being put on the list of cultural landmarks. The object bears features of French Renaissance manors, with numerous turrets and skylights. Its front is horizontally segmented and its utmost is its turret with entrance portal, balcony, and a turret clock. Its entrance embellishes a monumental staircase. Over the staircase can be found the heraldry of Jan Palffy and his wife. The interior of the manor is dated to the late 18th and early 19th century. Following the route leading to Cerveny kamen (the Red Stone castle), you can have a look at a chapel sacred to the Virgin Mary, the Lady of Lourdes, ordered by Jan Palffy, as well.